For decades, marine scientists have been warning of the demise of coral reefs in a warming world. But now, those warning calls have reached a full-scale alarm, leaving researchers at a loss for exactly how best to save the reefs. A study published Thursday in Science by some of the world’s top coral experts amounts to a last rites for the ecosystems often referred to as “the tropical rainforests of the sea.” Scientists surveyed 100 reefs around the world and found that extreme bleaching events that once occurred every 25 or 30 years now happen about every five or six years. With the time transpiring between bleaching events shortened by a factor of five, there isn’t adequate time for the ecosystems to recover. Even the fastest-growing corals that survive a major bleaching event need about 10 years to regain their health. These damaging events are now occurring more quickly virtually eliminates any serious chance of large-scale recovery on a global scale. Huge portions of the world’s reefs face almost certain death—and that loss will reverberate beyond earth’s oceans. 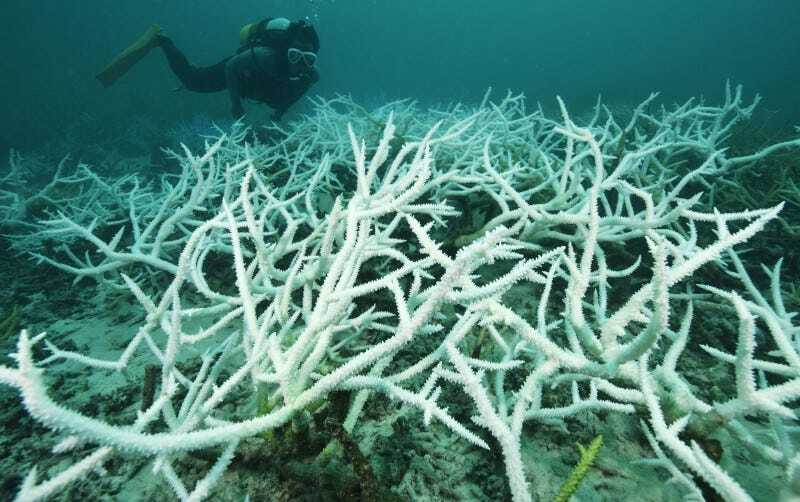 Bleaching happens when corals become overheated and expel the symbiotic algae that feed them. Without the algae to photosynthesize their food for them, corals stop growing and become more susceptible to disease. If water temperatures remain too high for too long, the corals can die. Cobb, who is not affiliated with the new study, had first-hand experience with the latest and most severe instance of global coral bleaching: a three-year event that hit almost every major reef system in the world and eventually decimated portions of the Great Barrier Reef. In 2016, around the height of the bleaching, she made a series of dives off remote Kiritimati Island, due south of Hawaii. There, Cobb watched in horror as roughly 80 percent of one of the most pristine coral ecosystems in the world died in a matter of months. “Before the 1980s, mass bleaching of corals was unheard of,” Terry Hughes, a coral scientist at Australia’s James Cook University and lead author of the new study, said in a statement. Hughes personally surveyed thousands of miles of the Great Barrier Reef during the 2015 and 2016 bleaching. “It broke my heart,” he told the Guardian last year. The new study finds that 94 percent of surveyed coral reefs have experienced a severe bleaching event since the 1980s. Only six sites surveyed were unaffected. They are scattered around the world, meaning no ocean basin on Earth has been entirely spared. The implications of these data in a warming world, taken together with other ongoing marine stressors like overfishing and pollution, are damning. “It is clear already that we’re going to lose most of the world’s coral reefs,” says study coauthor Mark Eakin, coordinator of the National Oceanic and Atmospheric Administration’s Coral Reef Watch program. He adds that by 2050, ocean temperatures will be warm enough to cause annual bleaching of 90 percent of the world’s reefs. Reefs are incalculably important not only as a harbor for life—they shelter about one-quarter of all marine species in just a half-percent of the ocean’s surface area —but also for human nutrition and many nation’s economies. Hundreds of millions of people worldwide depend on reef species as a primary protein source, and tourists bring tens of billions of dollars to coastal regions and island chains each year to get a peek at the underwater ecosystems. Researchers are struggling to think about what the loss of such an integral part of the Earth might mean in the decades ahead. And scientists, like NOAA’s Eakin, have changed their outlooks on the scale of action that’s necessary to save the world’s coral reefs. “We need to be looking at much more radical actions to preserve those reefs that we still can preserve,” he says. In the best case, some researchers point to extreme measures like genetically modifying super coralsto withstand increased temperatures, removing carbon dioxide from the atmosphere, or even geoengineering as the only remaining options for saving corals at a large scale. Another approach involves identifying the few dozen reefs around the world most likely to survive and instituting crash-conservation methods to transform each one into a kind of seed bank for future generations after climate change has stabilized. As you might expect, each of these ideas is highly controversial. But increasingly, coral researchers are willing to support a kind of “all-of-the-above” strategy, to avoid the worst case—losing corals entirely. If there’s one consensus among the coral community, it’s that this is unequivocally the last call for saving the reefs. It’s truly an all-hands-on-deck moment. This story was originally published by Grist.